This meter measures the flow rate as powder or granulated materials fall between two metal plates.It has no mechanically moving part so it provides a long life and stable measurement. The capacitance circuit uses the chopper method to switch the capacitance before the bridge input, meaning temperature differences have little effect. This meter’s simple design involves passing a powder between two metal plates. It has no mechanically moving part so it provides a long life and stable measurement. This meter is low in cost and easy to install. The analog meter directly reads the instantaneous flow rate. The digital meter directly reads the continuous integrated value and integrated values at specified intervals. The integrated microcomputer provides better operability and improved precision. Two metal plates opposite each other can store electric energy. This energy is referred to as capacitance.When any insulated substances such as powder and or a semiconductor enter passes between the two metal plates, the capacitance increases. This characteristic is referred to as the dielectric constant. If type of powder or granulated material does not change, this value is stable. Feed powder or granulated material so that it falls between the two metal plate electrodes. Measure the capacitance between these electrodes continuously. Then, changes in the flow rate cause proportional changes in the capacitance. 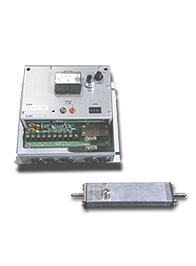 The FM701 employs our highly sensitive, high-precision capacitance measurement equipment as a converter. By adding a flow rate conversion and integration unit, it is designed to be a flow rate measurement system without any mechanical or moving parts.